A few amps, like the Fender Twin Reverb, have become standard pieces of gear because they are reliable, predictable, and just do the job very well. You can see Twin Reverbs on stages of almost any player at any level, where clear, clean tone has to fill a largish space. They are loved by country players because they can cut clean through a band and serve a large, active crowd; for touring bands, the promoter can be told to supply X number of twins for the backline and the band will know what they are going to get, that it will work, and be able to set up quickly. I seem to recall seeing pyramids of Twins used by the late Johnny Winter at Maple Leaf Gardens, decades ago. While it is a standard amp, the Fender Twin Reverb has evolved since it first appeared as the Twin Amp in 1952. At that point it was a 15-watt, 2×12 Tweed amp. It grew from 15 watts to 50 watts in 1955 and then to 80 watts in 1958, and got a brown Tolex covering in 1960. In 1963, Fender revamped their entire amp line, and the Twin Amp became the 85 watt Twin Reverb Amp. Since then it’s had a few changes, with some variations even getting up to 135 watts and sporting speakers by Altec Lansing. 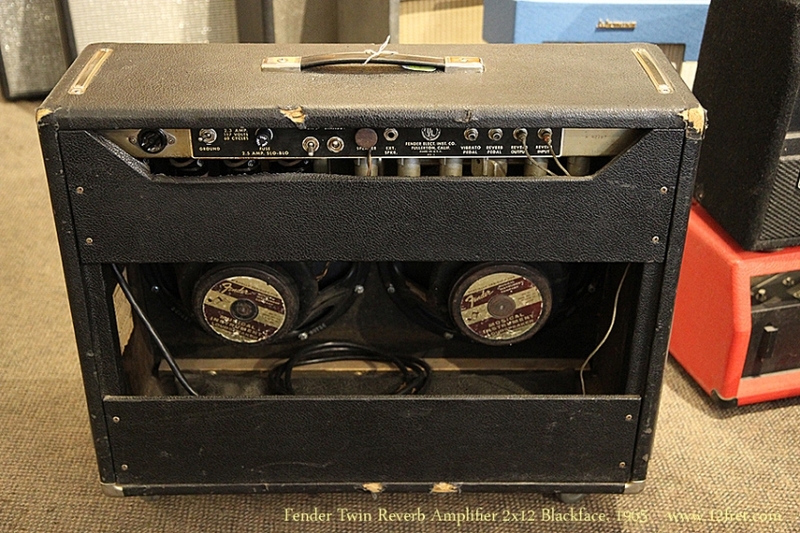 Fender’s current version is based on the 1965 Twin Reverb, 85 watts and two Jensen 12 inch speakers. 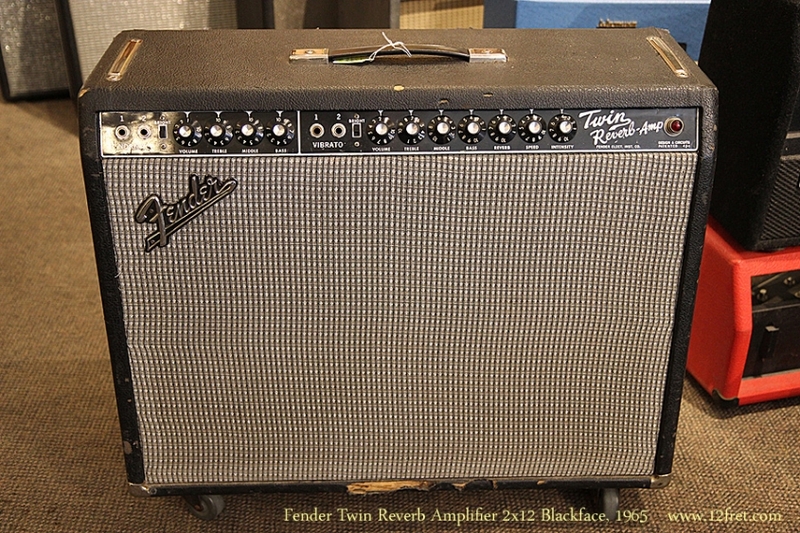 This is a Fender Twin Reverb in ‘Blackface’ dress, dated to 1965. The front control panel dates to 1964, the transformers to 1964 and 1965 and the speakers are 1965 production. The grille cloth was removed and re-applied but may possibly have been replaced. Over the last 42 years this amp has been used as intended, so it is not in perfect visual condition. There are some scuffs and tears in the black Tolex covering, notably on the bottom cabinet edges. Electronically, the amp is in good working order.